Eighteen years after the genocide that made Rwanda international news, yet left it all but abandoned by the West, the country has achieved a miraculous turnaround. Rising out of the complete devastation of a failed state, Rwanda has emerged on the world stage yet again - this time with a unique model for governance and economic development under the leadership of its strong and decisive president, Paul Kagame. Here, Patricia Crisafulli and Andrea Redmond look at Kagame’s leadership, his drive for excellence and execution that draws comparisons to American CEOs and emphasizes the development of a sophisticated and competitive workforce that leverages human capital. In Rwanda, the ultimate turnaround, strong and effective leadership has made a measurable and meaningful difference. Rwanda’s progress offers an example for other developing nations to lift themselves out of poverty without heavy reliance on foreign aid through decentralization, accountability, self-determination, and self-sufficiency. The authors also explore Rwanda’s journey toward its goal of becoming a middle-income nation with a technology-based economy and its progress in encouraging private sector development and fostering entrepreneurship while also making gains in education, health care, and food security - and all with a strong underpinning of reconciliation and unification. 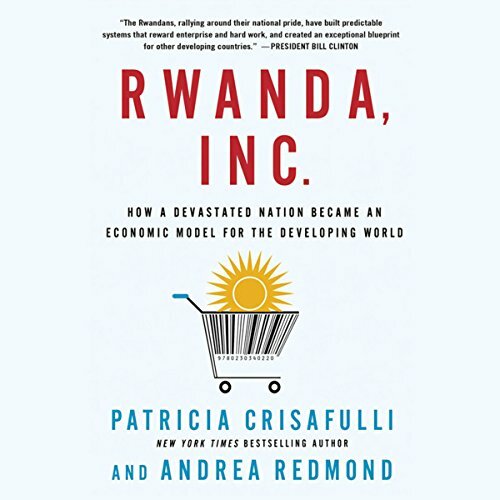 As so many nations stand on the brink of political and economic revolution, this is a timely and fascinating look at the implications of Rwanda’s success for the rest of the continent - and the world. ©2012 Patricia Crisafulli and Andrea Redmond (P)2013 Blackstone Audio, Inc.
What made the experience of listening to Rwanda, Inc. the most enjoyable? I read this book a while ago and subsequently I visited the country for the first time earlier this year. Then I bought the audio version for &quot;revision&quot; purposes. The story is still fascinating and this book captures the essence of this miracle. The &quot; yes, we can&quot; attitude. The genocide would make anyone sad. Why did they world just turn a blind eye?